“We are summoned to push back against those who would distort our religion for their nihilistic ends,” Obama said during remarks at the National Prayer Breakfast. He singled out the Islamic State group in Iraq and Syria, calling the militants a “death cult,” as well as those responsible for last month’s terror attacks in Paris and deadly assault on a school in Pakistan. Among those attending the annual gathering of politicians, dignitaries and faith leaders was the Dalai Lama, the spiritual leader of Tibetan Buddhism. As with the Dalai Lama’s past visits to Washington, his attendance at Thursday’s breakfast drew criticism from Beijing, which sees him as an anti-Chinese separatist because of his quest for greater Tibetan autonomy. In a show of White House support for the Dalai Lama, he was seated at a table with Valerie Jarrett, one of Obama’s closest advisers. The Dalai Lama fled to exile in India after a failed 1959 Tibetan uprising against Chinese rule, and Bejing regards U.S. dealings with him as interference in China’s internal affairs. Jordan’s King Abdullah II had also planned to attend the breakfast, but canceled plans and returned home after the Islamic State released a video this week of militants burning alive a captive Jordanian pilot. The images have sent waves of anger across the region. Obama has sought to discredit the notion that the Islamic State and other Islamic extremists are carrying out acts of terror in the name of religion. He accused those who make such claims of having “twisted and distorted” religion for murderous purposes. 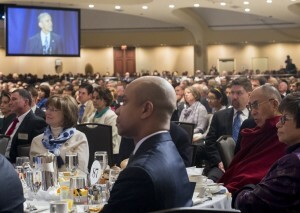 The president departed the prayer breakfast without appearing to have any direct interaction with the Dalai Lama. His motorcade sped past hundreds of demonstrators beating drums and waving Tibetan flags under a heavy police presence. The Dalai Lama, wrapping up a three-day visit to Washington, planned to speak later Thursday at a dialogue between Buddhists and Muslims on peaceful coexistence. Also expected are prominent American Muslims and a representative of Iraq’s most prominent Shiite cleric, Grand Ayatollah Ali al-Sistani. Danny Russel, the top U.S. diplomat for East Asia, told reporters Wednesday that it is appropriate for the Dalai Lama to attend the prayer breakfast because of his stature as a religious leader, and that Obama is a religious man who cherishes the event every year. Associated Press writer Matthew Pennington in Washington and Did Tang in Beijing contributed to this report.